Buying a mattress is harder considerably than buying a car, a piece of technology; I’d argue it’s harder than buying anything. It’s hard because you can’t test-drive it in its natural state, depending on where you live there may be limited access to ANY options, and the options vary so widely that it’s hard to find a middle ground on which to base your judgement. Concerns about bedding materials and the seemingly unhealthy nature of mainstream mattress options is finally breaking into the mainstream. However, this means that in the sea of healthy mattress options available, you’re playing a guessing game on the Internet with the hopes that the first one you pick it the right one. We decided that, being faced with the daunting undertaking of purchasing a new, healthy mattress, we’d do as much research as we could about what we were getting ourselves into. We dug deep into our sleeping habits. We asked questions about chemicals we never thought would be so close to us. We even made the silly choice in asking for samples, which only resulted in feeling confused by this spongy square of material and feeling a bit sad for all the packaging that wasted in its delivery. Polyols – the binder/bulk ingredient. Usually composed of petroleum oil-derived ingredients, but may also include botanical sources like soy or castor beans. Diisocyanates – the reactive ingredient. Reacts with the polyols and blowing agent to produce a flexible polyurethane foam. The most commonly used sources are MDI and TDI, which alone in raw forms can cause respiratory and dermal sensitization and may be carcinogenic. MDI is regarded as the safer and less toxic option, and is known to be the least hazardous organic isocyanate. The primary hazard with these compounds is during manufacturing; after reacting they are inert but can offgas. Blowing Agents – introduces carbon to create the foam. Used to use CFCs, though today manufacturers may use water, HFC or other agents. Methylene dianiline / MDA – suspected carcinogen, eye and skin irritant, liver and thyroid damage with ingestion. Household products produce very low levels, greatest risk is during manufacturing. Vinilideine chloride – eye and respiratory irritation, possible carcinogen, organ damage. Primary hazard is during manufacturing. Methyl benzene – inhalation can affect nervous system. Methylene chloride – a solvent, mucous membrane irritant and potential carcinogen. Use has declined in recent years due to EU restrictions and pollution regulations. Formaldehyde – typically not added to foams, but may result as a byproduct of chemical reactions or adhesives. While researching bedding and bedding companies, we came across some propaganda-seeming “research” touting that the company’s mattress wasn’t as gross as their competitors but also claiming that a chemical-free mattress doesn’t exist. If you want to split hairs and say that everything is essentially made of chemicals, that argument holds weight. But in the sense we’re covering here, there definitely are harmful chemical-free mattresses on the market that outperform their conventional counterparts in every qualification. 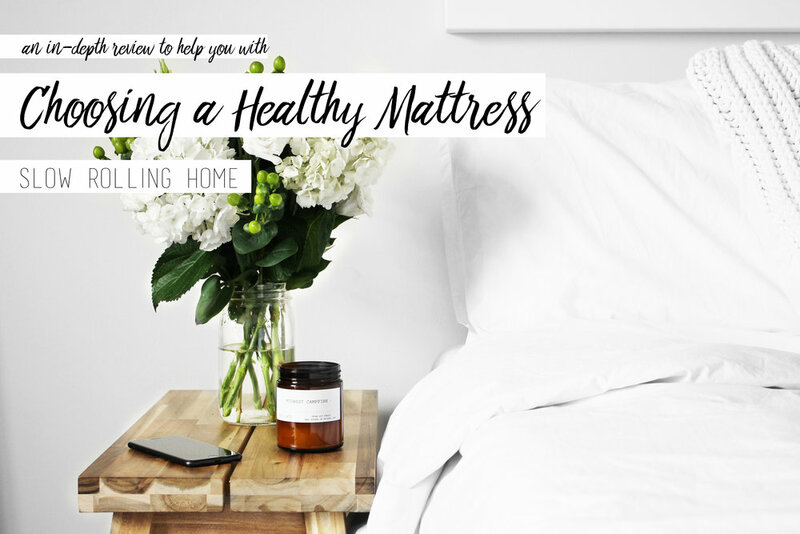 Plenty of healthy options definitely exist in the mattress market, but choosing one that fits all of your personal expectations takes more research than simply dropping in at your neighborhood Mattress Firm. You may learn a bit about bed technology and mattress materials (and a lot of marketing propaganda), but the truth is that the negative health effects of spending a third of your life on a flame retardant Petrie dish isn’t widely recognized by the people whose livelihoods depend on you buying those Petrie dishes. We’ve done copious amounts of research on available healthy options for bedding and have curated a selection of our personal standards, our constraints for our space, and our budget. It’s unavoidable that these more health-forward products be more expensive than their conventional alternatives. My justification is that you spend a third of your life on your mattress - you should choose the best you possibly can. Cotton: Cotton is often found in lighter-weight mattresses like futons or combined with an inner spring. Cotton is hypoallergenic, but not as resistant to dust mites as other mattress materials. Wool: Naturally mould and mildew resistant, wool wicks away moisture and keeps sleepers at a comfortable temperature. One small study at the University of Sydney in Australia found that sleep quality improved with wool versus cotton or synthetics. Wool is also naturally flame resistant, so wool mattresses don’t need additional flame-retardant treatment. Though wool is considered hypoallergenic, those with sensitivity to lanolin should probably steer clear. Latex: Natural latex mattresses offer some pretty appealing benefits as long as you don’t have a latex allergy. Some are even certified organic. Latex mattresses retain their shape really well, so the compression that can happen over time with other materials is less of an issue. Some latex beds are guaranteed for 20 years or more. They’re also known for limiting the amount of vibration you feel when someone on the other side of bed moves or twitches. How cool is it that wool, a natural ingredient that can be harvested without harming the animal from which it grows, is naturally flame-retardant and therefore doesn’t require additional chemicals? It makes me wonder why we use chemicals in the first place! With this in mind, these are the materials we’ll be looking for in our future mattress. 100% dunlop latex mattresses are the only latex beds that can be certified organic because the talalay manufacturing process uses ammonia and is not congruent with GOLS standards. Dunlop also comes in a 100% natural option. All other factors being equal, dunlop is more firm and supportive than talalay. This is offset by dunlop being a bit more durable. That’s why we generally recommend dunlop for the bottom support layers of your latex mattress. GOLS: stands for the Global Organic Latex Standard. GOLS sets the standard for organic latex worldwide, determining which latex is actually organic and which is not. GOTS: the Global Organic Textile Standard. Much like GOLS, it’s a leading standard worldwide but instead of for latex, GOTS is for textiles like cotton. OEKO-TEK: Also known as confidence in textiles, OEKO-TEK is an independent label for various textiles. LGA: global certifying agency who preforms tests for chemicals, toxicity, carbon foot print, water foot print and product life cycle assessments. Oregon Tilth: a United States organization who certifies sustainability in the marketplace. They help shape public policy towards more organic principals and practices. Eco-Institute: Originally a European certification, Eco-Institute’s services include manufacturing emissions testing and analyzing heavy metals, biocides, phthalates, fire retardants and more. These in-depth details come from Sleeping Organic LLC, a manufacturer of organic mattresses and bedding. This level of detail and certification right on a product page built a lot of trust with us as consumers and gives me reason to believe they may be a major contender in our bedding choices. Sleeping Organic’s product page is also an in-depth mattress personalization form. This made me think: Have I ever actually analyzed how we sleep? We’re different temperature sleepers: Alhen tends to “sleep cold”, meaning he can stay cool under covers, whereas I “sleep hot” and am often tossing blankets off various extremities throughout the night. Neither of us are very restless sleepers (unless we are uncomfortable), but both agree that we turn over occasionally. We both prefer a medium-squishy mattress and prefer a foam-support feel rather than a springs-forward feel. Surprisingly, we are both single-pillow users that prefer a medium-thin head support with a between-the-knees pillow, with both of us ending up primarily sleeping on one side. Taking everything we learned into consideration, we drafted our own standards to guide us in choosing our mattress. Warranty + customer service: While we don’t have much experience with warranties on large purchases like this, we want to be sure that if something goes wrong with our bed or we have questions down-the-road (literally), we know that we have a caring company who is committed to quality and their customers. Delivery options: We’re a bit remote and will need our bed delivered to us, preferably packaged such that we can get it through the doors of our bus! Free shipping is a nice bonus! This graphic from Savvy Rest put our budget into perspective. When it comes to budget, I’ll admit we didn’t have a specific number in mind when setting out to buy a mattress. We’re still young and haven’t gone through this process nearly enough to have an informed opinion of what this type of endeavor “should” cost or to be in the position of compromising our standards for price. So, for our bedding and linens (which include sheets, towels, and any other house linens) combined, we’ve elected to spend less than $2500. Over a 5-year period, that’s well worth living chemical-free! Without further ado, here are the mattresses we are comparing before making our big investment in better sleep! Materials: Natural latex, wool, organic cotton. Warranty: 100 night trial + 25-year limited warranty. Manufacturing Details: Handmade in the USA. Size: Full at 11" thick - This is above our limit but we are still considering this bed! Delivery Options: Free shipping + returns. Financing Available: Yes, at 10% APR provided by Affirm. Warranty: 90-day "Comfort Exchange" + 20-year Limited Warranty. You must sleep on it a minimum of 15 nights. Manufacturing Details: Made in the USA. Size: Full at 7" thick. Financing Available: Yes, through their internally-managed LifeKind Pay. Warranty: 100 days + 25 year warranty. Manufacturing Details: They claim "American Made Luxury" but I can't verify their manufacturing practices. Delivery Options: Free delivery via UPS. Warranty: 100 days + 10 years limited warranty. Manufacturing Details: Made in Chicago, USA. Size: Full, 7" or 9" thick. Financing Available: 12 month financing through Affirm. Delivery Options: Free shipping to residential address. Price: $1,495 + Tax, includes a free pillow! Financing Available: Provided by Affirm. Size: Full at 54" x 75", 10" thick. Delivery Options: Free 'white glove' delivery, home setup, and mattress removal. Financing Available: Provided by PayPal Credit. Armed with this multitude of information, we're going to dig into reviews, contact a couple companies for more information on their manufacturing practices, and take YOUR SUGGESTIONS into account! Do you have experience owning a non-toxic mattress? We'd love if you shared your experience with us in the comments below. Feel free to ask any questions that may not have been covered in the article. And, keep an eye out for our upcoming article on Natural & Non-toxic Linens for bedding and home use.